…This picture was taken during their first summit, “The G-20 Summit on Financial Markets and the World Economy,” which was held in Washington, D.C. two months after the Lehman Shock in 2008. 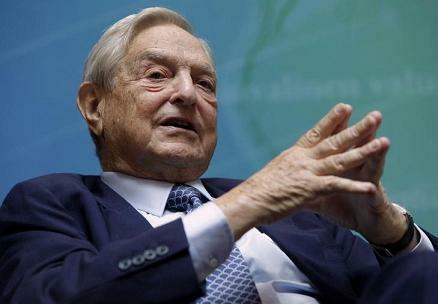 Almost a year later, FT conducted an interview of George Soros in which he subtly laid out the banksters’ post-crisis plan for ushering in the NWO. When a reader first passed me a link to the interview, though, I couldn’t believe my eyes. I thought it might be faked, so I did some checking on its authenticity and found out it was actually real. 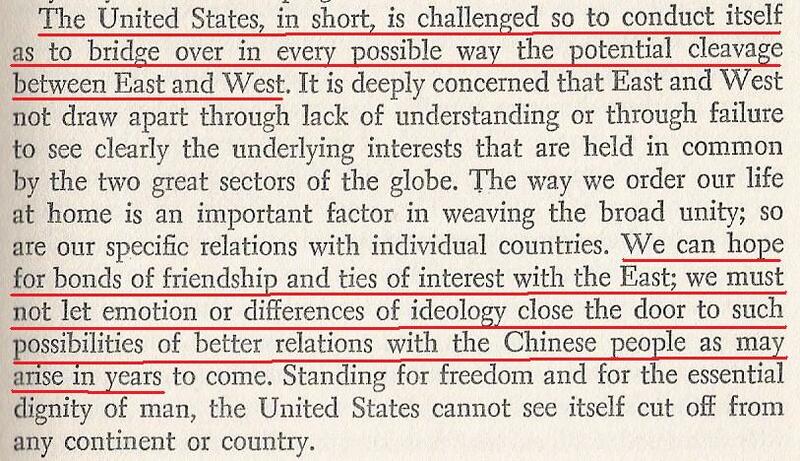 Here was George Soros — who is unquestionably a Western elitist even in the eyes of the most ardent Kool Aid drinker — speaking of using China to bring in the New World Order. But it just goes to show that the banksters have never really hidden what they’re doing; they just reveal it in dry interviews and insufferably bland policy papers while the public is distracted by an emotionally charged, easily understood “good guy” versus “bad guy” fairy tale. According to this fairy tale, which is offered by both the mainstream media outlets and the overwhelming majority of alternative media sources, the US is in conflict with Russia, and a determined band of freedom fighting nations (the BRICS) are on a quest to free themselves from the evils of Western imperialism once and for all. Well isn’t that precious? It’s also a load of childish bullsh*t.
…(from page 75) This is the entry I wrote about the book: The Rockefeller Plan for the BRICS New World Order, in their own words. Reaction – People are both angry and fearful, and are longing to end the old system and start something new. Why China? Why would the Illuminati, whose home base is in Western Europe, have the Chinese front the public face of their New World Order? So the globalists, recognizing the resolve of the peoples of the world to “emerge rapidly and conclusively from the era of colonialism,” have graciously provided them with a mechanism to do so: the BRICS alliance. And when the G20-connected BRICS emerge as victors over the “insane” G20-connected Western powers, the peoples’ longsuffering desire will find satisfaction. They will finally be free from the uncomfortable grip of the banksters’ Left Hand so they can rest more comfortably in the snug embrace of the banksters’ Right Hand. Ain’t freedom grand? 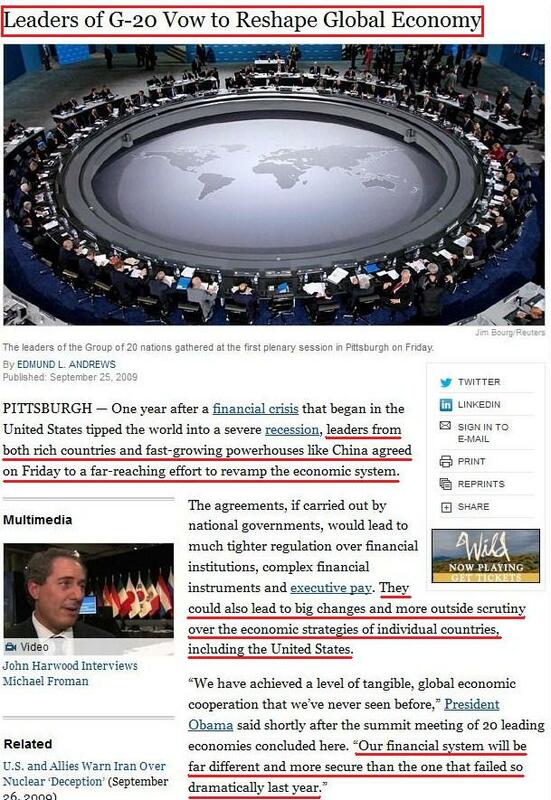 So here you have it: both “rich countries” (the West) and “fast-growing powerhouses” (the East) agreeing to a “far-reaching effort to revamp the economic system” and to oversight by the globalist-run International Monetary Fund (which is part of the United Nations complex). In other words, they agreed to join together to create the New World Order. >>> The Group of Twenty (also known as the G-20 or G20) is an international forum for the governments and central bank governors from 20 major economies. The members, shown highlighted on the map at right, include 19 individual countries—Argentina, Australia, Brazil, Canada, China, France, Germany, India, Indonesia, Italy, Japan, Mexico, Russia, Saudi Arabia, South Africa, South Korea, Turkey, the United Kingdom and the United States—along with the European Union (EU). The EU is represented by the European Commission and by the European Central Bank. 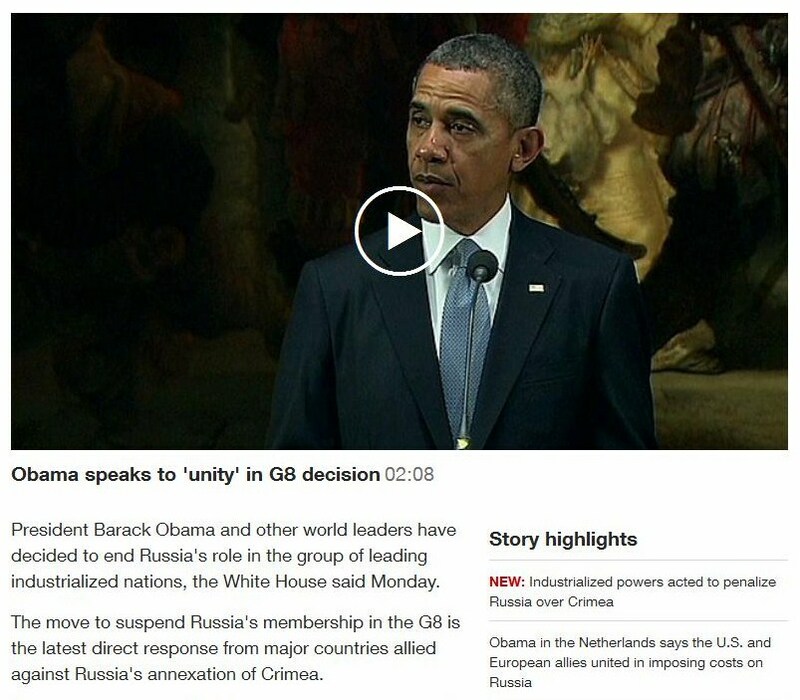 So when Russia was kicked out of the G8 in early 2014 (supposedly over the staged conflict in Ukraine), it was a purely symbolic gesture designed to give some semblance of reality to the phony East versus West dialectic. The (now) G7 is just a sideshow; the real action takes place in the G20 (to which Russia still belongs). >>> The G-20 is the latest in a series of post-World War II initiatives aimed at international coordination of economic policy, which include institutions such as the “Bretton Woods twins”, the International Monetary Fund and the World Bank, and what is now the World Trade Organization. 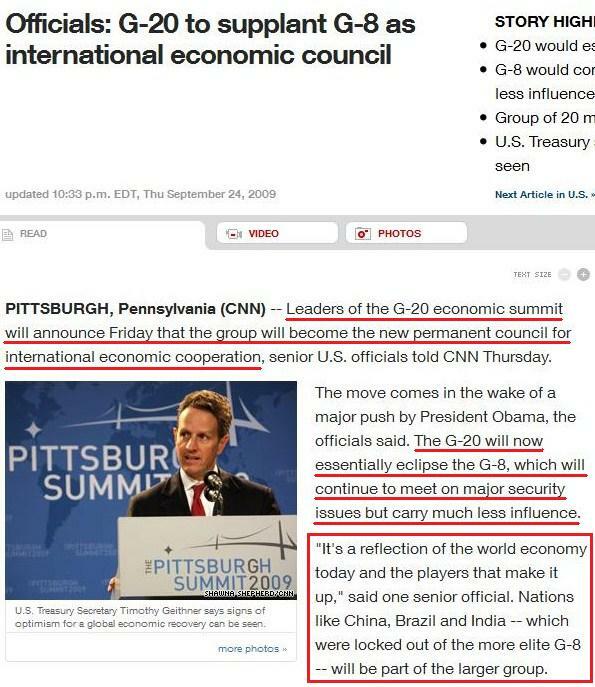 The G-20 superseded the G33 (which had itself superseded the G22), and was foreshadowed at the Cologne Summit of the G7 in June 1999, but was only formally established at the G7 Finance Ministers’ meeting on 26 September 1999. 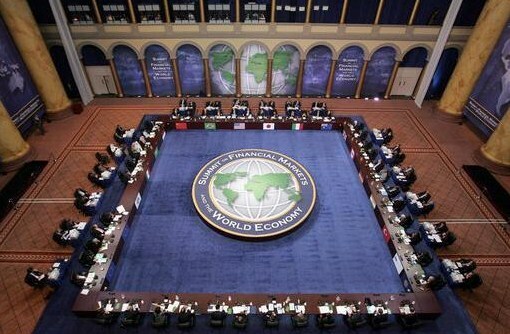 The inaugural meeting took place on 15–16 December 1999 in Berlin. Canadian finance minister Paul Martin was chosen to be the first chairman and German finance minister Hans Eichel hosted the inaugural meeting. in Europe, they have the EU to lead the integration. Note how the Russian government is talking about terrorism and climate change as if they were real phenomena that weren’t purposefully stirred up / fabricated by the “elite.” In this, they are following the globalist problem / reaction / solution template. >>> BRIC partnership is becoming increasingly important amid the global economic and financial downturn, when the four countries should coordinate their efforts with the international community to weather the crisis on global financial markets and reform the world financial system. 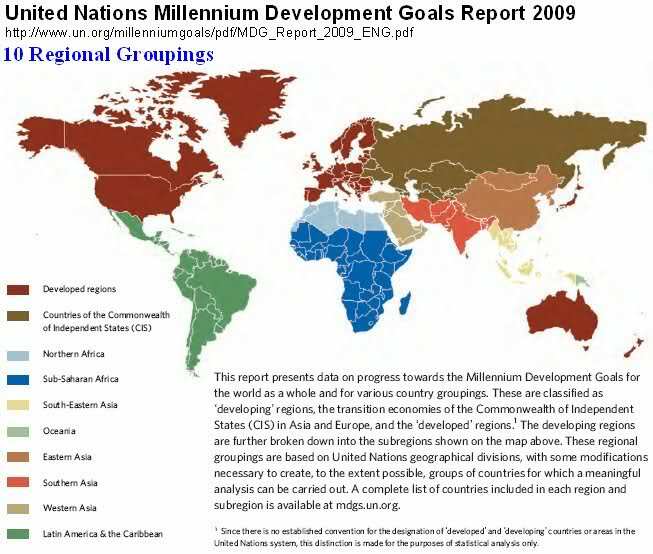 So the BRICS started in the UN. No surprise there. So they got together for a full-scale meeting just months before the Lehman Shock in September 2008. Interesting timing. I will show you their joint statement after we finish with this one. >>> Ties between the BRIC foreign ministers were completed by the meetings between their finance ministers in Sao Paulo, Brazil, on November 7, 2008 and in London on March 13, 2009. The finance ministers adopted joint statements on their meetings, which reflected common views of global economic problems, including the reasons for and ways to weather the global financial crisis. So they made plans for a full-scale summit just two months before Lehman. >>> Official contacts in the BRIC format have been buttressed by interaction between the respective regional authorities and public organisations. The Foreign Ministers of Brazil, Russia, India and China (BRIC) held their meeting in Yekaterinburg, Russia, on May 16, 2008. The Ministers emphasized that the BRIC dialogue is based on mutual trust and respect, common interests, identical or similar views on pressing problems of global development and has bright prospects. The Ministers agreed that building a more democratic international system founded on the rule of law and multilateralism is an imperative of our time. They pledged to work together and with other states to strengthen international security and stability and ensure equal opportunities for development to all countries. >>> The Ministers noted that sustainable development of global economy in the long-term as well as finding solutions to the acute global problems of our time, such as poverty, hunger and diseases are only possible if due account is taken of the interests of all nations and within a just global economic system. Among other issues they discussed the current global food crisis. The Foreign Ministers of Russia, India and China welcomed the initiative of Brazil to organize a meeting of economy and/or finance ministers of the BRIC countries to discuss global economic and financial issues. The Ministers expressed their strong commitment to multilateral diplomacy in dealing with common challenges to international security. They reiterated their support for political and diplomatic efforts to peacefully resolve disputes in international relations. A cooperative approach to international security is required that takes into account the concerns of all and addresses them in a spirit of dialogue and understanding. The Ministers emphasized that disarmament and non-proliferation are mutually reinforcing. They also agreed on the need for multilateral efforts to prevent an arms race in the outer space. The Ministers unequivocally condemned terrorism in all its forms and manifestations, committed for whatever purposes. They reiterated that terrorism constitutes one of the most serious threats to international peace and security and that the international community should take necessary steps to enhance cooperation to prevent and combat terrorism. They particularly highlighted the importance of the UN cooperation framework and the need for all member states to implement international conventions of the United Nations and UN Security Council resolutions on fighting terrorism. So according to the BRIC nations, what is the solution for globalist organized and funded terrorism? Implementing the policies of the globalist UN of course. >>> The Ministers noticed a close interconnection between energy security, socio-economic development and environmental protection. They reaffirmed their commitment to the multilateral efforts aimed at reaching an optimum balance of interests between producers, transit states and consumers of energy resources. In this respect the parties emphasized the need for supporting energy programmes, such as programmes to increase access to energy, energy efficiency as well as the development and use of new and renewable sources of energy, including biofuels, which are compatible with sustainable development. Here the BRIC nations are promoting the concept of human-induced global warming just like the carbon traders want. As you can see from their own words, the BRICS are helping to bring about a UN-led New World Order. So if you are one of those who are still holding on to the illusion that they are your saviors coming to rescue you, what’s it going to take to wake you up? Should I beg? This update can be found in this new article. This entry was posted in NWO on January 19, 2015 by kenneth.